Blog 100 Percent Efficiency? Great! and So What? A particularly brilliant and demanding manager for whom your editor used to work had a “SO WHAT?” stamp with which he would critique our technical papers and proposals. His point in defacing our papers was not to be snide, but to force us to defend why we included certain facts – interesting though they may be in themselves. Two different and equally brilliant discoveries by University of Cambridge and University of California, Riverside researchers bring the “so what?” stamp to mind. Even with their breakthroughs, approaching 100-percent efficient solar cells in the first instance, solar cells may not yet be a perfect fit for aircraft propulsion. Each square foot of the earth’s surface receives about 15 Watts of solar energy during a bright day. 100 square feet of solar cells (about what we could expect for an average-size wing on an average light plane) would see 1.5 kilowatts hitting that surface – not enough to sustain flight on anything but a very light, low-powered machine like a human-powered airplane. Because most current solar cells, especially organic ones, don’t get much better than 25-percent efficiency, that reduces the actual charge reaching the plane’s batteries to 375 Watts. That will certainly help recharge the batteries while the airplane is parked, and help extend the range even though only fitfully. How do people like Eric Raymond and the Solar Impulse engineers make this disparity work? First, they make airplanes that are very light, have large wing areas, and are thus slow by comparison with most cross-country cruisers. They also carry batteries to help them generate extra power for takeoff and use only about one-tenth of their takeoff power to cruise. This allows the sun to help the batteries catch up with the power demand. Eric has the added advantage of being able to soar his aircraft, using no power while things recharge. On the ground, the solar cells bring the batteries up to full charge for the next takeoff. Both planes can thus make the truthful statement that they are totally self-sufficient in their solar operations. “[Cambridge] researchers have developed a new method for harvesting the energy carried by particles known as “dark” spin-triplet excitons with close to 100-percent efficiency, clearing the way for hybrid solar cells which could far surpass current efficiency limits,” according to research news from the University. Photons absorbed by a conventional silicon solar cell cause the formation of one free electron that can be extracted as current. Researchers explain that this is similar to what happens in photosynthesis. One photon hits the pigment of a leaf, for instance, and generates an exciton that carries the associated energy through the plant. Solar cells do a bit of biomimicry to emulate this stimulus-response action in plants. Ask.com explains an exciton is “a bound state of an electron and an electron hole which are attracted to each other by the electrostatic Coulomb force. It is an electrically neutral quasiparticle that exists in insulators, semiconductors and in some liquids. The exciton is regarded as an elementary excitation of condensed matter that can transport energy without transporting net electric charge.” This explanation, without the desire to do further research in subatomic or quantum physics, is probably next to useless. You may now pull out your own “So What?” stamps. When light is absorbed in pentacene, the generated singlet excitons rapidly undergo fission into pairs of triplets that can be efficiently transfered onto inorganic nanocrystals. Combining organic and inorganic semiconductors and spin-singlet and –triplet excitons has made it possible to unleash the energy from both, with heightened efficiency. The team used state-of-the-art femtosecond laser spectroscopy to see that triplet excitons could be transferred directly into inorganic semiconductors, from which their electrons could be easily extracted. “’Combining the advantages of organic semiconductors, which are low cost and easily processable, with highly efficient inorganic semiconductors, could enable us to further push the efficiency of inorganic solar cells, like those made of silicon,’ said Dr. Akshay Rao, who lead the team behind the work.” Their work can be found in Nature Materials in their October 5 online edition. Further work by the research team will focus on other organic/inorganic systems and creating an inexpensive organic coating that could increase silicon solar cells’ efficiency. This initiative is backed by the UK Engineering and Physical Sciences Research Council (EPSRC) and the Winton Programme for the Physics of Sustainability. Singlet fission is a process in which a single photon generates a pair of excited states. This 1->2 conversion process has the potential to boost solar cell efficiency by as much as 30 percent. 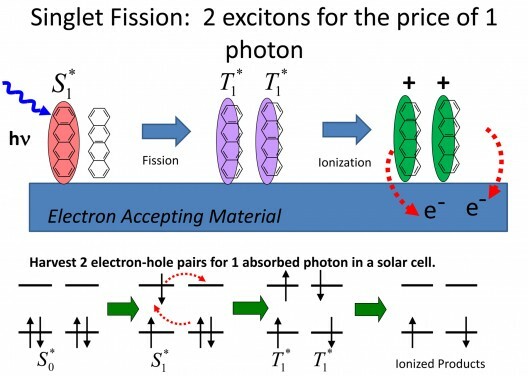 Current solar cells are limted by the Shockley-Queisser Limit,” around 32-percent efficiency brought about by the reaction to one photon generating one exciton. Future cells will need to do better while remaining inexpensive. “’If a triplet exciton has half the energy of a singlet, then it is possible for one singlet exciton, generated by one photon, to split into two triplet excitons. 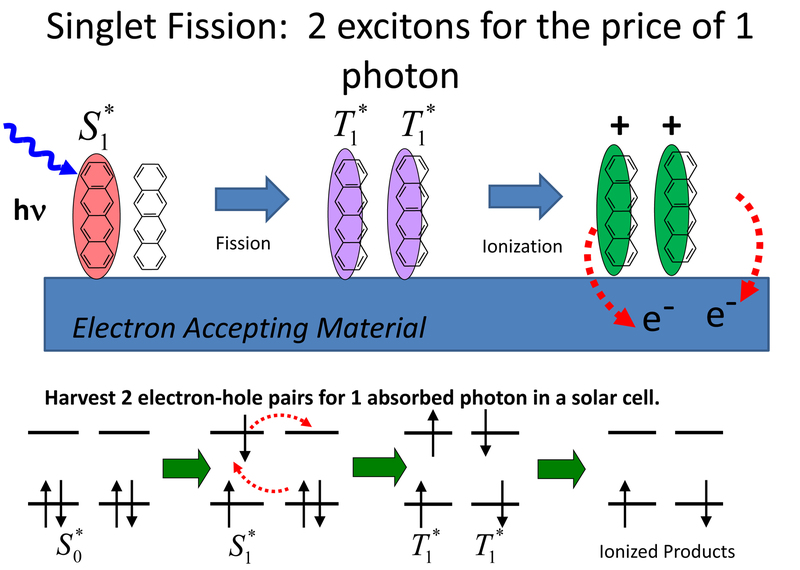 Thus, you could have a 200 percent yield of excitons — and hopefully, electrons — per absorbed photon.’” Part of the magic is to extract two excitons from a high energy exciton rather than waste the energy as heat. This spontaneous splitting of a single exciton into two triplets requires further investigation. The research was supported by a grant to Bardeen from the National Science Foundation. He was joined in the research by Geoffrey B. Piland, Jonathan J. Burdett and Robert J. Dillon at UC Riverside. With at least three major academic institutions pursuing a similar line of research, these advances could become ever more important as researchers dodge around the limits of the Shockley-Queisser Limit, and possibly the idea of what 100-percent efficiency means today. This will lead to smaller, lighter solar cells with higher efficiency. This will allow designers to make smaller, lighter, solar-powered craft, and we may someday see practical machines we can all fly, kept aloft with the power of the sun alone.